CULTURE OF REVOLUTION · Customer Obsession Do it yourself GM ISN'T THE ONLY COMPANY trying to deepen its understanding of the customer. The concept of anthropological research has been around for decades. More recently, executives are supplementing professional re- search with their own customer exposure. 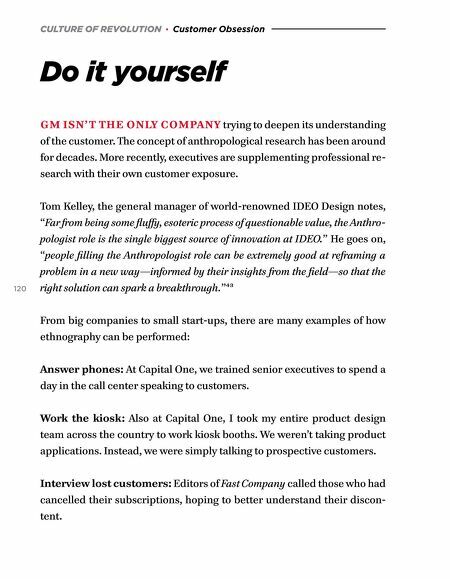 120 Tom Kelley, the general manager of world-renowned IDEO Design notes, "Far from being some fluffy, esoteric process of questionable value, the Anthro- pologist role is the single biggest source of innovation at IDEO." He goes on, "people filling the Anthropologist role can be extremely good at reframing a problem in a new way—informed by their insights from the field—so that the right solution can spark a breakthrough. "43 From big companies to small start-ups, there are many examples of how ethnography can be performed: Answer phones: At Capital One, we trained senior executives to spend a day in the call center speaking to customers. Work the kiosk: Also at Capital One, I took my entire product design team across the country to work kiosk booths. We weren't taking product applications. 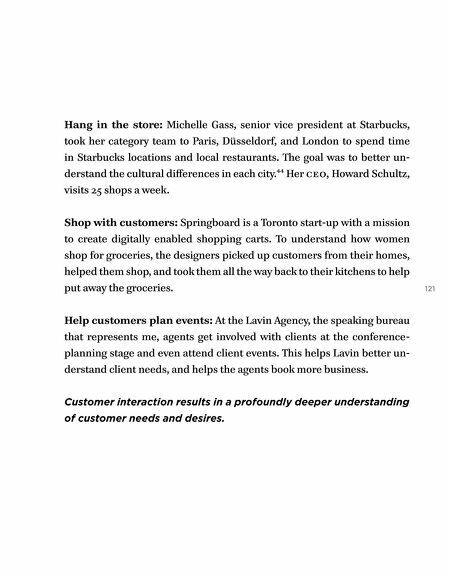 Instead, we were simply talking to prospective customers. Interview lost customers: Editors of Fast Company called those who had cancelled their subscriptions, hoping to better understand their discon- tent.